The International Monetary Fund has offered Ukraine a two-year bailout package of $18 billion in return for steep economic reforms. The long-term goal of the bailout package is to stabilize a Ukrainian economy that is running up expenses and moving toward a debt default. It is hoped that economic stability in Ukraine will lead to the political stability that can then ease Ukraine’s transition to democracy, and more importantly, away from Russia. By opening up to the IMF deal, Ukraine will signal to nations like the US and Japan that they are committed to restructuring their economy and are open to investment. For example, the United States Congress is working on a bill for $1 billion in aid to Ukraine as well as economic sanctions against Russia. The European Union has put $15 billion on the table. It total, Ukraine is in position to receive around $27 billion in aid. The downside to these deals is that the enforced austerity measures will likely hurt the average Ukrainian citizen by increasing gas prices by 50% and inflating the currency, the hryvnia, by somewhere between 12% and 14%. 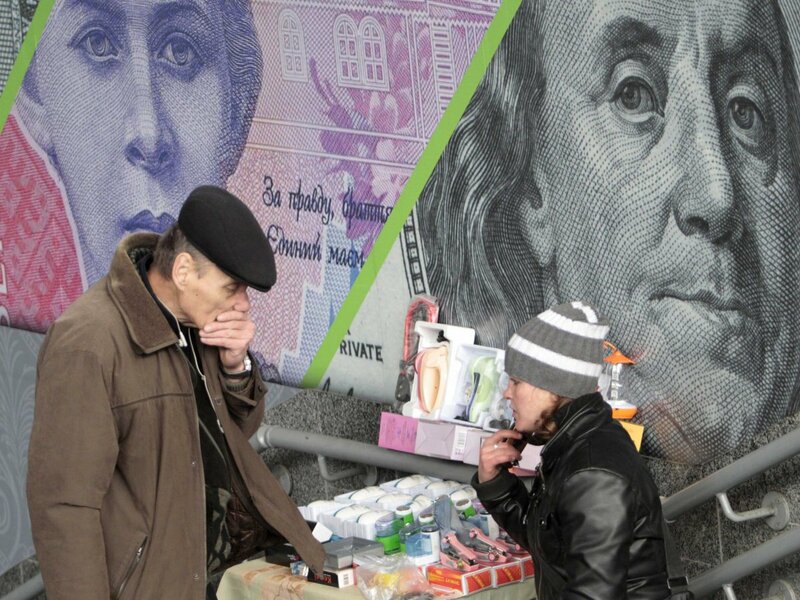 Therefore, we may see the cost of living rise while the purchasing power of the hryvnia plummets. Ukraine’s interim Prime Minster Arseniy P. Yatsenyuk explained that there would be a minimum-wage freeze and an increase in taxes for Ukraine’s largest companies. All of this spells out hard times for Ukraine in the coming years. But consider the result if Ukraine were not to accept the austerity measures. As The New York Times reported, Yatsenyuk “told the Parliament on Thursday that the country was ‘on the brink of economic and financial bankruptcy’ and that gross domestic product could drop 10 percent this year unless urgent steps were taken in conjunction with the fund.” With such instability, Ukraine’s interim government would not have the time or the legitimacy to set up the proper institutions before the planned election in May. The top candidates for the election include former Prime Minister Yulia V. Tymoshenko, billionaire businessman Petro Poroshenko, and Parliamentary leader as well as former professional boxer Vitali V. Klitscho. Tymoshenko, who was born in the industrial and Russian-leaning eastern Ukraine, has support from the western and central provinces. However, it is Poroshenko and Klitscho who lead in the polls. No matter the result in May, the next president of Ukraine is set to face a difficult transition in all aspects of society. Somehow, he or she must ease the pains of economic liberalization, consolidate political factions, and reign in nationalist as well as pro-Russian sentiments. International aid may help, but the real battle for Ukrainian independence must be fought from within. It is a fight to defeat the legacy of authoritarianism; a fight that Ukraine desperately needs to win. The Center for Global Prosperity is focused on educating policy leaders and the general public on the crucial role of the private sector (both non and for profit) as a source of economic growth and prosperity around the world. To accomplish this central mission, the Center produces The Index of Global Philanthropy and Remittances, which identifies the sources and amounts of private giving around the world and The Index of Philanthropic Freedom, which identifies the barriers and incentives to private giving in 64 countries. Is Fair Trade Actually Fair? The 60s Called. They want the Peace Corps Back.